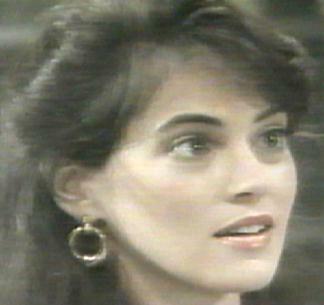 Portrayer: Joanna Going, January 26, 1987 - February 27, 1989. Arrival: Came to get to know her aunt, Felicia Gallant. Departure: Left because of her break up with Jamie Frame. Introduction Scenes: (January 26) Appearing in Jamie Frame's daydreams. (February 12) In TOPS garage to Jamie Frame, "Excuse me." Exit Scene: To Matthew Cory before taking one last look at her apartment, "Okay." Last Known Whereabouts: London, England. Lovers: Jamie Frame (fiance) (1987-1988). Dates: Adam Cory (1988) and Matthew Cory (1989). Medical History: Psychic. Raped at age 14. Former Occupation: Police psychic. BCPD's community affairs representative. Studied to be a lawyer in 1989.